When You Really Want to Get to the Bottom of the Ocean #WearableWednesday #wearabletech #science #ocean « Adafruit Industries – Makers, hackers, artists, designers and engineers! This research project may rank in my top ten for wearables for the year, just because the target wearer is sea life. 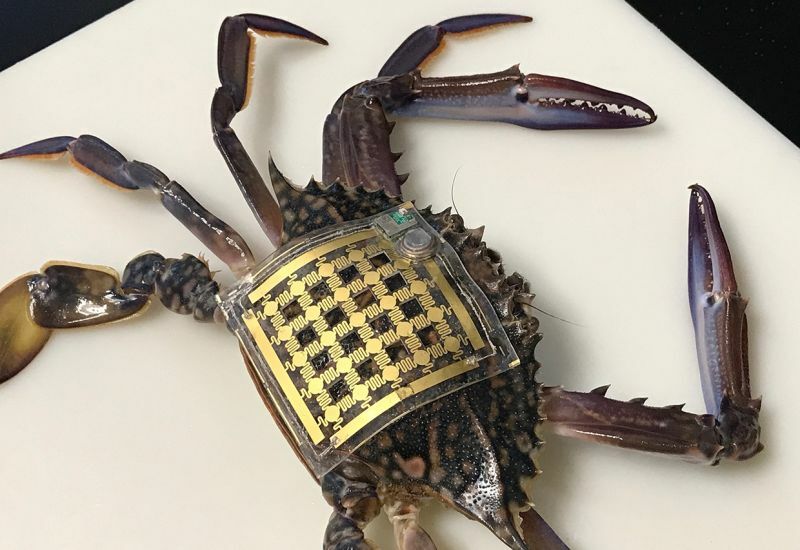 Spotted on TechCrunch, this marine skin is being developed by a team at King Abdullah University of Science and Technology in Saudi Arabia in collaboration with the Red Sea Research Center. The Center has a strong interest in the Red Sea’s coral reefs as they represent one of the top three reefs in the world. So, animal tagging is an important component for collecting data, but the process is often invasive and/or clumsy. The hope for this project is that these new skins will be comfortable for the creatures, which may include whales, sharks and crabs. The marine skin uses a flexible silicone substrate and a design that can survive being twisted, torqued and put under serious pressure at up to moderate depth. It tracks the salinity and temperature of the water and distance below the surface; this could be used to track either the creature’s own preferences or to monitor the waters in which it swims or crawls. Another big advantage of this tracker is that it is inexpensive, coming in around $12 per unit. So far the unit is using Bluetooth, which limits the range, but hopefully a solution will be found that will be good for battery life and communication. Of course the real question is whether the world’s reefs can be saved since they are key to so much life.